Find out how much credit banks of a given nationality have extended to borrowers in more than 200 countries, using the consolidated banking statistics. The BIS consolidated banking statistics (CBS) are a useful starting point for analysing banks' exposure to country risk - the risk that borrowers may be unable or unwilling to fulfil their foreign obligations for country-specific economic or political reasons beyond the usual counterparty-specific factors. However, the CBS provide only part of the information needed for a comprehensive analysis of these exposures. In this box, we summarise what the CBS show and do not show about them, using as an example the data published about Turkey in Table B4 on the BIS website. The CBS provide information about the country and sectoral composition of banks' assets on a worldwide consolidated basis. In particular, they capture the outstanding claims and other exposures of banking groups headquartered in 31 reporting countries on counterparties in over 200 borrower countries, excluding intragroup positions but including the business of foreign banking subsidiaries that are majority-owned or otherwise controlled by the group. At end-March 2018, foreign banks had $223 billion in outstanding loans, securities holdings and other claims on residents of Turkey (Graph C, left-hand panel). More than half of these claims ($135 billion) were on borrowers in the non-bank private sector - mainly non-financial corporations and households, with smaller amounts on non-bank financial institutions. Claims on banks accounted for a further $50 billion, with the remainder, $38 billion, on the official sector - government and central bank. 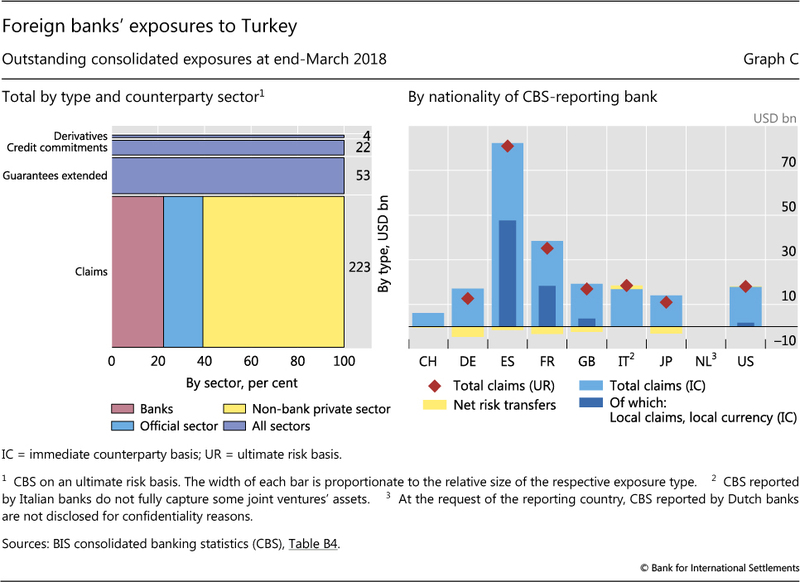 On top of these claims, foreign banks had exposures to Turkey through three additional items: derivatives contracts with counterparties in the country, the positive market value of which stood at $4 billion at end-March 2018; credit protection sold against entities in Turkey and other guarantees extended ($53 billion); and outstanding credit commitments to resident borrowers ($22 billion). For assessing banks' vulnerability to country risk, the absolute size of exposures is a less relevant metric than the relative size - for instance, scaled by banks' total equity or Tier 1 capital. Indeed, the banks with the largest absolute exposures to a country are often not those most exposed relative to capital. For example, at end-March 2018 Belgian banks' claims on Turkey (less than $1 billion) were much smaller than the claims of German banks (nearly $13 billion), but relative to total capital the two banking systems had similar exposures (2.3% and 2.4%, respectively). Even when scaled, the CBS provide only a rough indication of which banks are the most vulnerable to country risk because of the high degree of aggregation and incomplete information. The CBS sum together the exposures of all banking groups headquartered in the reporting country and consequently may mask large differences among individual banks. They also sum together various types of exposures (eg loans, guarantees), which may have very different risk characteristics. Furthermore, some banks' outstanding exposures may be closer to their market value than those of others, depending on accounting practices and the share of the portfolio invested in assets with reliable fair market values. Finally, the CBS exclude provisions that banks might have set aside against potential losses. Information about banks' business models is also relevant to understanding how banks might respond to adverse developments in a country. An especially important factor is the structure of banks' foreign business. Some banks conduct their international business mainly on a cross-border basis out of their home country or in financial centres. Other banks follow a multinational model and set up foreign subsidiaries, in which they invest specific amounts of capital and that borrow locally to finance assets. The CBS do not distinguish between these business models. Yet a multinational bank could choose to sell its subsidiary or even let it fail, writing down the capital that the bank invested in its subsidiary. If it were to do so, the bank's exposure would be limited to its equity participation in the subsidiary plus any intragroup funding and guarantees extended to the subsidiary. This sum is likely to be substantially smaller than the assets of the subsidiary that are included in the exposure measures of the CBS. The CBS provide some information, albeit imperfect, about the importance of subsidiaries by dint of the distinction between local and cross-border claims. Local claims are those booked by branches and subsidiaries located in the same country as the counterparty. Local claims can in turn be decomposed into those denominated in local currencies (LCLC) and those in foreign currencies (LCFC). In the CBS on an immediate counterparty basis, LCLC are published separately but LCFC are published jointly with cross-border claims as "international" claims. In Turkey, local claims denominated in the Turkish lira (TRY) amounted to $82 billion at end-March 2018. In addition, LCFC accounted for a substantial portion of the $164 billion in international claims. As a result, local claims denominated in all currencies accounted for over 50% of foreign banks' total claims on the country. 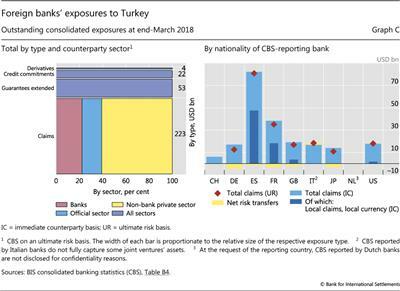 The published CBS show that Spanish and French banks had the largest TRY-denominated local claims on Turkey, at $48 billion and $18 billion, respectively, at end-March 2018 (Graph C, right-hand panel). A substantial portion of these banks' international claims are also local claims, denominated in foreign currencies. Italian and Dutch banks also have exposures via local subsidiaries, but these are not adequately captured in the published CBS. Data from the European Banking Authority show that Italian banks had total exposures on Turkey, including guarantees and credit commitments, in excess of $67 billion and Dutch banks $34 billion, albeit at end-June 2017. Notably, in US dollar terms, the exposures of those banks with Turkish subsidiaries fell significantly in mid-2018 owing to the sharp depreciation of the TRY and the consequent decline in the US dollar value of their TRY-denominated claims. Another way that banks can reduce their exposure to a given country or sector is by using credit risk transfer instruments to shift risks from one counterparty to another. One common example is buying credit protection through credit default swaps. The CBS on an ultimate risk (UR) basis take account of banks' use of such risk transfers and so provide a measure of banks' exposure that complements the on-balance sheet claims captured by the CBS on an immediate counterparty (IC) basis. Banks tend to use risk transfers to hedge a larger share of their cross-border exposures than their local exposures. Consequently, country risk transfers tend to be proportionately larger for banks that conduct mostly cross-border business, as opposed to multinational banks with subsidiaries. For example, at end-March 2018 the IC claims of Spanish banks on Turkey, which are mostly booked through local subsidiaries, were only 2% ($1 billion) higher than their UR claims. By contrast, UK banks' IC claims, which are mostly in the form of cross-border claims, were 14% ($2 billion) higher than their UR claims. In summary, the CBS provide a useful starting point for analysing banks' country risk exposures, based on a set of simple metrics. However, a fuller analysis requires them to be combined with information about banks' business models, financial health, consolidation and accounting practices, and risk transfers. Such information is regularly provided by supervisors and banks themselves, in their communications about the possible impact of and responses to adverse developments in borrower countries. For further discussion of what the CBS show, see BIS, "What the BIS banking statistics say (and what they do not) about banking systems' exposures to particular countries and sectors", BIS Quarterly Review, March 2011. The perimeter of consolidation is not harmonised across reporting countries. For a summary of differences, see BIS, "Potential enhancements to the BIS international banking statistics", Annex B, March 2017. The CBS reported by Italian banks do not fully capture some joint ventures' assets, while the exposures of Dutch banks are not disclosed for confidentiality reasons.